Born out of conflict and de facto in existence, Nagorno Karabakh Republic centers the 13th year of its independence still coping with a war-depleted economy and adjusting to its status as an unrecognized country. A high-rise residential building has recently been completed near the bottom of Freedom Fighter Boulevard..
On an occasional glimpse Stepanakert, the capital of Karabakh, shows little evidence of a post-war city. More likely, the impression is of a city on the move rather than on the mend. Major streets are clean, and traveled by people who are well dressed and affable. Shops and markets offer a variety of goods and products; mini buses are filled with riders who seemingly have urgent purpose. The collapse of the Soviet Union and the fundamental changes in the social economic life did not pass painlessly even for the most successful former soviet republics. For tiny Karabakh, transition hardly had a chance to make a footprint – trampled instead by the ravages of battle. Still, the visible problems that Stepanakert faces now are typical of the region, bearing the familiar bruises of market-economy transition more than its previous open wounds of war. The labor exchange in the center of the city could be found in many other cities of the former Soviet Union, where men gathering in morning offer themselves for whatever work is available. Other residents survive running makeshift business on improvised counters and kiosks, selling sunflower seeds, chewing gum, cigarettes, etc. But upon entering Stepanakert’s work places, universities and public offices, foyers decorated with black and white photos of dead students, employees, officials – “martyrs” of liberation – are reminders that Karabkah’s scars cover injuries inflicted by ethnic hatred and not merely by political upheaval. Smooth, lighted and curbed – the streets of the capital. And in villages, where ruined buildings show the effect of bombs rather than neglect, black square holes that used to be windows tell that war has a recent history here. The vicious four-year war with Azerbaijan would have been enough to permanently alter a country Karabakh’s size. Coinciding as it did with the collapse of the Soviet Union, it is something near a miracle that any infrastructure survives. As a result of war, 85 percent of active enterprises and 50 percent of all public buildings were destroyed or damaged. Almost all communication facilities were disabled. Physical war damage to the country is estimated at more than $3 billion, with more than $1 billion in the capital, $800 million for industry and communications and the rest for health, education and agriculture sectors. The war completely or partly destroyed about 226 multistory buildings, 11,647 houses and more than 150 settlements. But the subsequent years of stability and peace and the strong and systematic support of Diaspora and Armenia have partly mended the diminutive but torn enclave. The opening of the Lachin corridor in 1992 reconnected the territories of Karabakh and Armenia, putting to end decades of isolation. Physical connections between the two were restored between 1995-99 with the Goris-Stepanakert Highway, which, until last year’s (Lincy Fund-financed) roadway reconstruction project in Armenia, was a far superior thoroughfare than most in the region. The All Armenia Fund spent $10.2 million to make the “Road of Life” a reality. Work has been underway for four years on the North-South Highway, which will bring the same quality of transportation for internal travel in the republic. So far, 69 kilometers have been completed and work continues on the entire 170 kilometers. The entire construction is expected to cost $25 million and will be no less a “road of life” for farmers with produce to sell, village students wanting to attend university in Stepanakert and for traders, whose enterprise has been hampered by nearly-impassable internal roadway. Ter Hovanes used a gun and a bible during the conflict. . 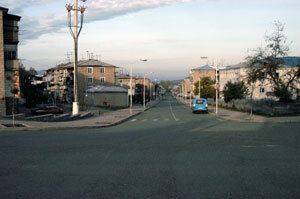 Already, in Stepanakert, streets that for years were little more than craters are smoothly paved, curbed, and lighted. And they are increasingly trafficked by imported vehicles that would hardly have been imagined during post-war economic depression. Since the 1994 ceasefire 5,000 houses and 200 multistoried buildings damaged in the war have been reconstructed. 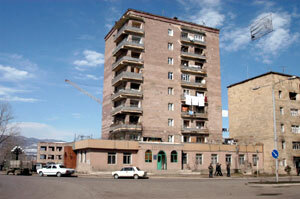 Additionally, two multistoried (residential) buildings have built in Stepanakert; and another two will be completed soon. And while the capital shows the most cosmetic change, the outskirts are getting attention too. Schools have been rebuilt in the villages of Shekher, Her-Her, Khachen, Khndzristan and others. With little money of its own to spend, the Government of Karabakh has become active and successful fundraisers, finding more than $50 million for reconstruction over the past decade. Though Stepanakert shows the most obvious signs of new life in Karabakh, rebirth of a war zone has not been limited strictly to the capital. Nor have all the improvements been for purely economic purposes. Villagers, whose yards, orchards and croplands had for more than a decade been reservoirs of danger holding unseen and deadly land mines, are now able to move about more freely. residential complex financed by AGBU is among new multi-storied buildings. .
Further development of infrastructure has been completed since USAID entered Karabakh (though restricted to only humanitarian assistance) in 1998 as part of the Freedom Support Act. Spending about $20 million of an expected $35 million, the Americans’ five-year program has focused on three primary interests: water, shelter, healthcare. As part of the initiative, three major irrigation projects, three community centers and five schools have been built or rebuilt. Additionally, five maternity hospitals damaged by war have been repaired and 43 health clinics opened outside Stepanakert and mobile medical units see about 500 (mostly indigent) patients per month. Thirteen villages, home to about 5,600, have benefited from a water and sanitation project administered by Medicins Sans Frontieres of Belgium. And now that progress is being made rebuilding Karabakh’s body, attention is turning to its collective mind and soul. Artur Jivanshirian the director ofStepanakert’s Agricultural Technical School says that the country needs highly qualified specialists in different economic sectors. 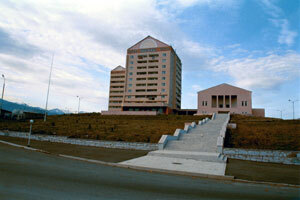 To encourage the youth of Karabakh, Jivanshirian initiated the opening of a college attached to the school. There, a two-year education is free and students can learn skills to become mechanical engineers, technicians, crane and tractor operators. 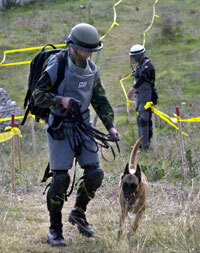 USAID-financed mine clearing is returning Karabakh’s land to its farmers. . Physical damage was obvious and severe. But the Armenians of Karabakh are also still recovering from cultural and spiritual wounds. Starting in 1920 when Josef Stalin attached the Nagorno-Karabakh territory (95 percent populated by Armenians) to Azerbaijan Soviet Socialist Republic, the government of Azerbaijan conducted a systematic policy of removing Armenians from Karabakh. From 1923 to 1979 the Armenian population of Karabakh was reduced from 150,000 to 120,000 while the population of Azeris in Karabakh in the same period grew from 7,500 to 38,000. Islamic Azeris destroyed many churches and ancient cemeteries in Karabakh and after 1930 no church was functioning in Karabakh. Prior to independence the national liberation movement revived Christianity in Karabakh, opening the Gandzasar monastery in the Mardakert province in 1989. War became the spiritual godfather for the priest of Gandzasar monastery Ter Hovanes (Hovanes Hovanisian), who before the war was an agriculturist. 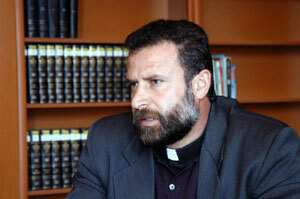 “In the beginning of the Karabakh movement I met priests from Artsakh diocese. They asked me if I wanted to become a priest. Their suggestion took me by surprise, because I never was thinking of becoming a priest and had a family,” he recalls. In 1990 he went to Echmiadsin and returned in two years as Ter Hovanes. He was appointed a superior of Gandzasar and spent the years of war with a cross in one hand and a weapon in the other. 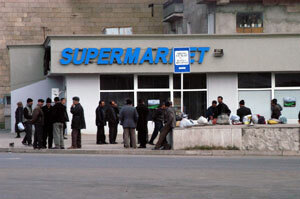 Stepanakert’s super market has become the job market for men in search of day. Next year Karabakh will celebrate the 765 th jubilee of Gandzasar. Now Ter Hovanes is fully devoted to the Church and his parishioners. He says that today people need spiritual support as never before. At present there are 11 priests in Karabakh who are in charge of 24 restored or new churches, while construction and restoration of others continues. While the signs of war disappear around them, but still suffering less obvious damage, Karabakh Armenians are never far from a memory of their heroes. The capital’s main street is called Freedom Fighter Avenue. Marriage ceremonies start near the memorial to their “liberators”. And where soldiers once fell, buildings are now going up that carry the names of those whose lives were spent for the costly construction of a republic fiercely free, if not yet fully independent.